I’m sprawled out on a cozy bed, the May sun streaming through the blinds. I’ve got nothing more pressing to do on a Saturday afternoon than read a book. I crack it open (or softly bend it open, ’cause it’s a paperback), and begin to read the book that’s been sitting by my chair for months. 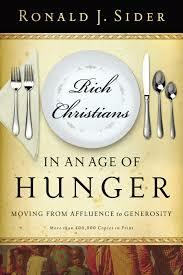 I begin to read Rich Christians in an Age of Hunger, and I know that change is afoot. Sure, all the stats are off (it was published in 2005), but the heart and soul of the book remains the same. Because it’s the heart and soul of the gospel, really, only in numbers and facts and practice. Due to overconsumption, small numbers of affluent people strain the earth’s limited resources far more than much larger numbers of poor people (30). Is ten percent really enough? It’s hard enough for me to write that check on Sunday, to drop it in the plate and trust that it will be put to good use. Because that’s what I’m doing: trusting. Trusting God to use the money I give to further His Kingdom. Trusting my deacons and trustees and pastors to look to Him for guidance. Trusting that I will also pay my bills on time and not overdraw. I am a fearful person. Those of us in developed countries make up only one-fifth of the world’s population, yet we consume two-thirds of the planet’s resources (31). So what am I going to do? Keep putting that ten percent in the offering plate? Keep sending money to India in the hopes that one boy will have a brighter future? Give to my friends who go on missions trips? Support another child in Africa? Egypt? South America? Today, I didn’t buy a new sweatshirt. I wanted one, a green one that said “Cape Cod” because my old one wore out. I didn’t buy one after all – there wasn’t one exactly like I wanted. I walked out of the store – sweatshirt-less and annoyed – and thought, Maybe that’s what I have to do. Be mindful of where the extra goes because there’s more than enough to go around. Advertisers promise that their products will satisfy our deepest needs and inner longings for love, acceptance, security, and sexual fulfillment (24). I’m only a quarter of the way through the book, but I’m slowly working towards change. Change in myself is a hard thing to make. This entry was posted in a little angst?, adulthood, faith and tagged church, donating, faith, hunger, money, poverty, trust on May 18, 2014 by catherine_hawkins. I would love to hear what you think once you’re finished with the whole book! And not just what you think, but how that change that was “afoot” a couple weeks ago has begun to take shape. Want to chat sometime?